Five years ago, Earth's extrasolar colonies were stranded in the depths of the void. The disappearance of the teleporting Upeo wa Macho left our children orphaned indeep space. Now, after years of experimentation, work and alien collaboration, the new jump ships are complete and have returned to our lost outposts. Learn the fate of the extrasolar colonies! Trinity Field Report: Extrasolar Colonies is the first in a series of debriefings from the Aeon Trinity for its psion agents. 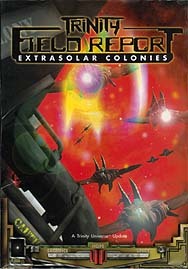 This report reveals first contact with the abandoned interstellar outposts, from the mysterious Qin homeworld to the shocking events at Karroo to the Aberrant-ridden Khantze Lu Ge! Earth's space legacy lives again - and you're a part of it!